A year ago, it was easy to be unaware of CBD. Fast forward to 2019, and CBD in skincare, health and wellness has evolved from a trend to a full-fledged revolution. The hype is comparable to the discovery of yoga, coconut oil or maybe even oxygen. Everyone from fashion editors to retailers and celebrities are singing its praises, but in an industry with new brands popping up every day, little regulation and no FDA oversight, CBD and is overwhelmingly akin to the wild west. Fortunately, with the passage of the 2018 Farm Bill, hemp derived CBD is on track to become legal nationwide. To put the hunger for CBD into perspective, the market for hemp-based CBD could top $22 billion by 2022, according to Brightfield Group, a market research firm that specializes in cannabis. This would also mean the implementation of much-needed standards and requirements for CBD products. 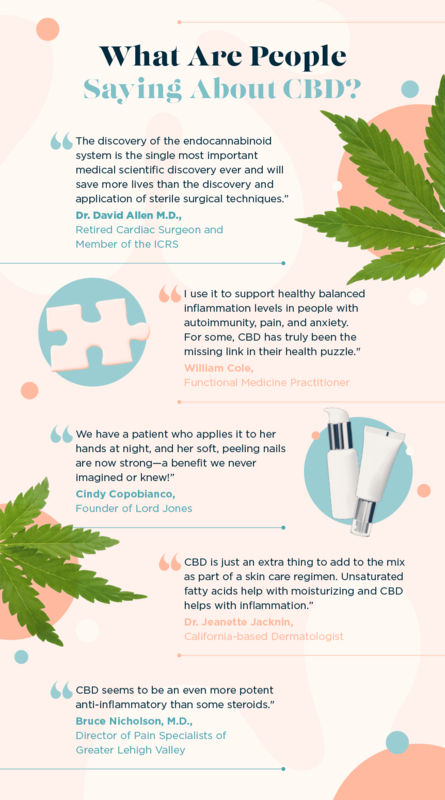 In the meantime, if you’re one of the many individuals looking to reap the holistic benefits of CBD, you’ll want to know what to look out for and how to incorporate it into your routine. 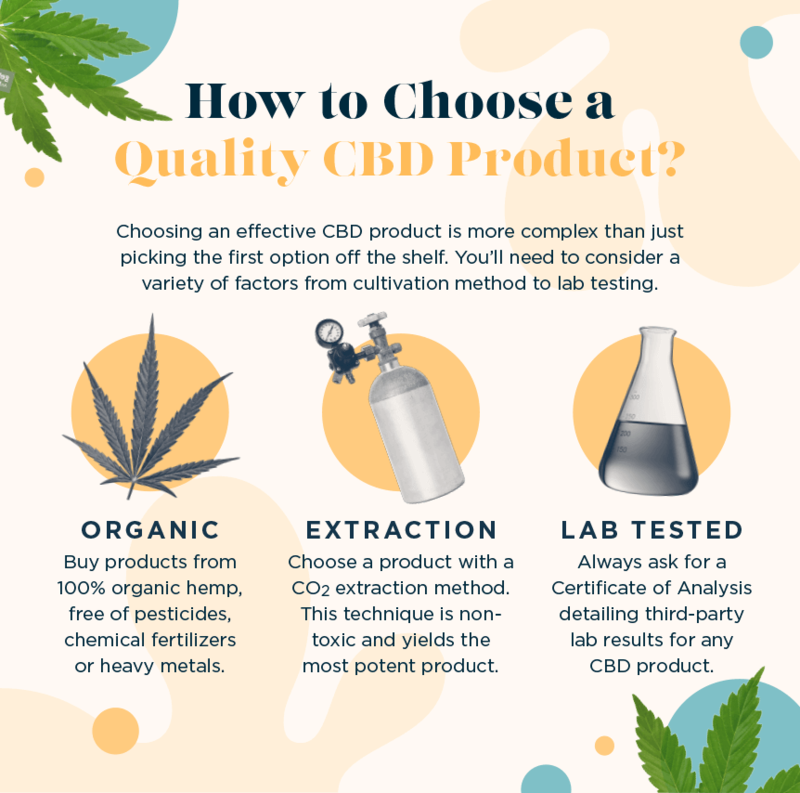 In this guide you’ll learn more about CBD as a holistic trend, what to consider when purchasing a CBD product (like how the plant is grown, extraction methods, purity and potency) and how to weave it into your daily routine. If there’s ever a good time to dive into wellness and self-care, it’s the New Year. So, let’s get started. To be clear, we’re talking about cannabidiol, or CBD, a non-psychoactive compound of cannabis plants. It is widely popular for helping relieve anxiety, insomnia, pain, and inflammation. CBD doesn’t come with intoxicating effects and is most commonly used for its health and wellness benefits, especially for pain-related symptoms. The beauty about CBD and a large driving force behind this trend is that you don’t have to get high to reap the benefits of cannabis. Hemp-based CBD products are THC free. With that said, there are some cannabis wellness products that contain a ratio of CBD to THC, but you’ll have to visit your local dispensary to buy them. Products that contain both CBD and THC have unique health benefits and typically provide better pain-relieving results. If your state has legalized both compounds, you might want to look for a product with 1:1 CBD to THC ratio for the best relief. CBD works by acting on the body’s endocannabinoid system. This system’s main job is to maintain homeostasis and help the body adapt to outside stressors. Similar to the way adaptogens, like ashwagandha and maca root, have become popular herbs for stress management, CBD can also be consumed as a supplement and incorporated into your daily routine to benefit your endocannabinoid system. We’re all looking for ways to get better sleep, reduce anxiety and have an overall better quality of life. CBD may help address these health issues when incorporated into your routine. The U.S. Institute of Health estimates that as many as 70 million people in the United States suffer from chronic, treatable sleep disorders, with insomnia affecting more than 30 million people. It would be an understatement to say that there’s a problem at hand when it comes to beauty rest. 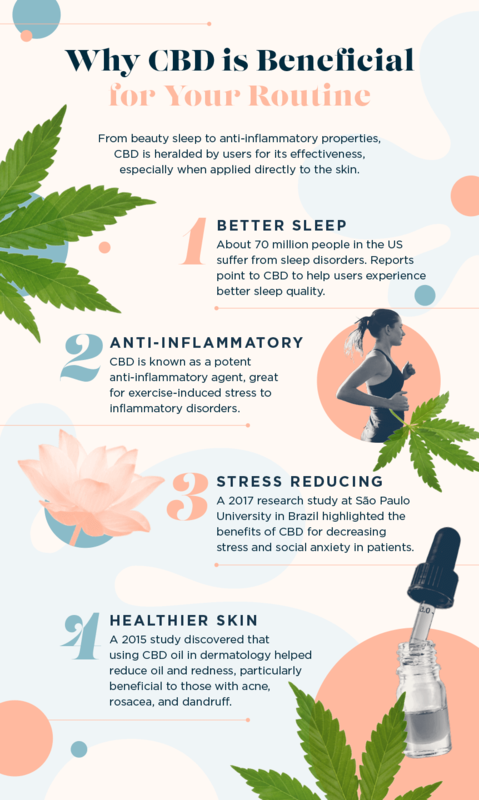 While there are few official studies on the effects of CBD for sleep, there’s a wealth of anecdotal evidence and reports that point to CBD as helpful for falling asleep faster and experiencing better sleep quality. CBD is most commonly noted for its anti-inflammatory properties. From exercise-induced inflammation to inflammatory disorders and diseases, studies have found CBD to be a potent anti-inflammatory agent. While physical activity is good for you, it doesn’t come without some setbacks, often in the form of swelling, pain and muscle soreness. Instead of grabbing for the bottle of ibuprofen, try substituting for CBD. You wouldn’t be alone in this either—many modern athletes are ditching ibuprofen for CBD. There may be no scientific consensus about how effective CBD is compared with anti-inflammatories like ibuprofen or naproxen, but that could all change soon. At least 20 clinical trials examining the medical benefits of CBD are currently under way in the U.S., including a $16 million effort by the University of Miami, which is looking into CBD’s effects on brain trauma. CBD’s role in treating stress is huge—not only because 31 percent of U.S. adults experience anxiety disorders at some point, but because stress exacerbates so many other common health issues like heart disease, GI problems and headaches. Incorporating CBD into your routine won’t directly solve every ailment, but it could help treat the underlying problems of stress and anxiety that so many of us experience. Several studies point to the benefits of CBD for anxiety induced insomnia, PTSD and stress. CBD was also shown to decrease social anxiety in patients during a 2017 research study at São Paulo University in Brazil. The beauty world has been particularly interested in CBD. It’s poised to bring your skincare routine to a higher level. But how? Most of us know that inflammation is the root cause of so many skin woes, from acne to rosacea. Because cannabinoids hold many anti-inflammatory and antioxidant benefits, using CBD in your skincare routine can help reduce puffiness, swelling, soreness and even acne. A 2015 study discovered that using CBD oil in dermatology helped reduce oil and redness, which was particularly beneficial to those with acne, rosacea, and dandruff. Currently, the United States’ Department of Health and Human Services has a patent on cannabinoid as an antioxidant, which would potentially have anti-aging and protective benefits for the skin. At this point, you might be convinced that CBD should be a part of your daily routine. There’s no shortage of CBD products out there, so it won’t be hard to find some. From the protein powder you put in your morning smoothie to the lip balm you apply throughout the day, there’s at least one CBD product you can incorporate into your lifestyle. Here are 3-4 no-fuss steps you can weave into your daily routine to start using CBD products. Hydrate—Water should always be the first thing you run to in the morning, and if it’s not, start there. Add a few drops of CBD oil to your morning glass of water and drink up. Fuel—If you’re an early bird who likes to get their morning workout in, make a post workout protein shake or smoothie using a CBD protein. Throw in a spoonful of hemp seeds for some extra nutrition and taste. Keep in mind that CBD and hemp protein are different things. Cleanse—After your workout, jump in the shower with a CBD infused soap. Take it a step further and lather up using a CBD infused shampoo and conditioner. Moisturize—Never pass up the opportunity to moisturize. Use a CBD face and body lotion to complete your morning routine. Maintain—You can use this step any time of the day, then repeat. Apply CBD lip balm to keep chapped lips at bay during the cold winter months. Moisturize—Ah the best part of the day. When you come home from work and wash your face. Instead of applying a tradition serum to your freshly cleansed face, swap this for a CBD face serum and eye balm. One those have settled, you can re-apply your CBD face and body lotion. Wind down—Once you have everything accomplished for the day, wind down by making a cup of CBD tea. As is the case in the food industry, knowing where your CBD extract comes from is crucial. 2019 might be the year we start seeing more CBD brands touting sustainable sourcing and transparency as a way to distance themselves from less reputable competitors. While these companies do exist, it’s important to do your due diligence when purchasing a CBD product. Unfortunately, not all CBD brands and products are created equal, and not all contain the amount of CBD they say they do. That’s why you should always purchase from ethical brands that provide a certificate of analysis (COA) or disclose their lab test results from an unbiased, third-party. A COA includes important details like the potency and levels of CBD, purity and any known bacterial and soil contaminants. Additionally, you should always purchase from a company that grows organically. CBD derived from organic hemp is less likely to have contaminates from harsh pesticides and heavy metals found in the soil. Buy Organic—Always choose product that’s come from 100 percent organic hemp. It should be cultivated without pesticides, chemical fertilizers or heavy metals. Choose a Clean Extraction Method—Choose a C02 extraction method for a high-quality CBD product that is both safe to produce and consume. Lab Tested—Always ask for a Certificate of Analysis (COA) that details third-party lab results when purchasing any CBD product. Reputable companies will have no problem providing these results. If you get any pushback or the results are unavailable, it’s best to consider this a red flag. Because you should only be spending your money on effective CBD products, we’ve saved you the time and done our due diligence by requesting and searching companies that offer up their lab-test results. The handful of brands listed below offer CBD skin-care products that meet quality standards, clean extraction methods and provide their lab test results either upon request or on their websites. This company is best known for its CBD Youth Serum. The Mender Apothecary Body Essentials Collection contains a terpene-rich profile derived from organic essential oils and full-spectrum triple-tested CBD extracted in California using a solvent-free CO2 process. This makes it clean enough to be food grade—which makes it safe for sensitive skin. The CBD is tested in-house first and second by a certified lab in California after formulation to ensure purity, potency and safety. This company is best known for its CBD Blemish Control. Myaderm’s products are formulated by pharmacists, but also undergo tests and attain results from Botanacor labs to ensure that each batch of CBD products are pure. This company is best known for its CBD Calming Eye Balm. Cannuka uses a mixture of hemp-derived CBD isolate, manuka honey and Vitamin E to deliver moisture and brightness to the skin near the eyes. The CBD isolate is tested by Botanacor and found to be 99.7 percent pure. This company is best known for its CBD Infused Lip Balm and CBD face lotion. Vertly’s lip balm not only soothes dry and chapped lips, but it delivers anti-inflammatory properties too. Vertly’s CBD is also extensively tested throughout the production stage—starting at the hemp farm and again during product production. Because Vertly is partnered with Credo, a natural beauty store and spa, they are held to the same product standards. This company is best known for its Shea Honey Oat Body Bars. Each product contains a certificate of analysis that details the potency and purity of the CBD used. The company adheres to third-party SC Labs testing to confirm the purity of CBD. This company is best known for its Hemp Infused Cream. They provide a certificate of analysis, upon request, for any product they sell. Consumers can also look up the lab results for each individual batch through their online portal. Best known for their High CBD Formula Body Lotion, Lord Jones boasts a “whole plant” CBD extract in its products, which contains most of the plant’s original compounds, including other non-psychoactive phytocannabinoids, terpenes and plant waxes to create a broad spectrum, whole plant formula. Each batch is independently lab-tested for potency, pesticides, contaminants and residual solvents. What People Are Saying About CBD? Because CBD is not legal in every state, it has been difficult to research, resulting in a limited amount of scientific data. CBD is still in the early stages of scientific study. Fortunately, the legalization of hemp will be groundbreaking for the CBD industry, opening doors and providing better access for researchers. In the meantime, there are many doctors, medical practitioners and patients who’ve been experimenting with CBD for years. Not only do they advocate for its use, but they have some unique insights and experience with the benefits of CBD. There’s a wealth of anecdotal evidence and information from reputable sources on the benefits of CBD, and this will only continue to grow in 2019. In the next section, we address some common questions about obtaining CBD and its legality in the U.S.
CBD has long existed in the gray area of the law, despite going mainstream. 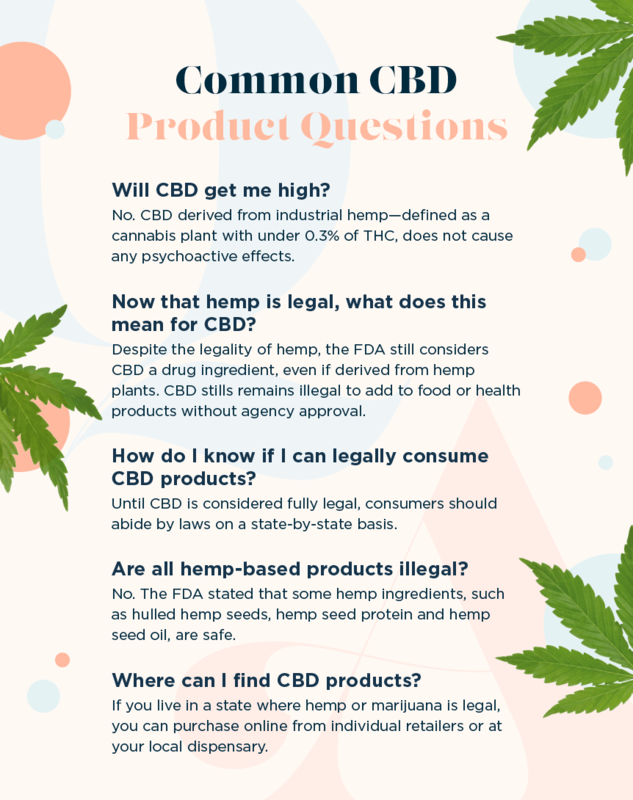 With the growing popularity and the most recent news of hemp legalization, it’s important to understand where CBD sits on the spectrum of consumer goods. Historically, hemp has been illegal to sell or grow in the US, although it’s legal to buy from international sources. It was commonly thought that hemp-derived CBD would become federally legal when the 2018 Farm Bill passed. Unfortunately, this is still not the case. While hemp has a wide range of uses and is now legal across the United States, CBD is still considered a drug ingredient by the FDA, even if derived from hemp plants. CBD businesses must obtain agency approval to add to food or health products. What does this mean for consumers? Until CBD is considered fully legal, consumers should abide by the laws of the state in which they live when consuming CBD products. Below, we’ve addressed some common questions about purchasing CBD products. CBD still sits in a grey area, but that doesn’t negate its positive effects or its popularity. As more research is conducted and scientific data becomes available, it won’t be long before the legal status of CBD changes. When it comes to holistic trends for 2019, CBD oil is definitely the new coconut oil or avocados. There’s a wealth of products out there for you to integrate into your skin care and daily wellness regimen from pain-relieving body lotions to eye serums to oils. With that said, not all CBD products are created equal. Always do your due diligence and look for reputable companies that offer up lab-tested products and aren’t simply capitalizing on the buzz around the ingredient. Purchasing an effective product is not only beneficial for you, but also helps to de-stigmatize and normalize CBD. If you’re still unsure about a product, it’s always safe to visit your local dispensary and discuss questions about the CBD products they offer.